-When you strapped the saddle bags down securely the tailpiece pressed in on the luggage reducing the inside capacity. -The saddlebags hung down very close to where the trunk/helmet lock is located which made it awkward to use these. 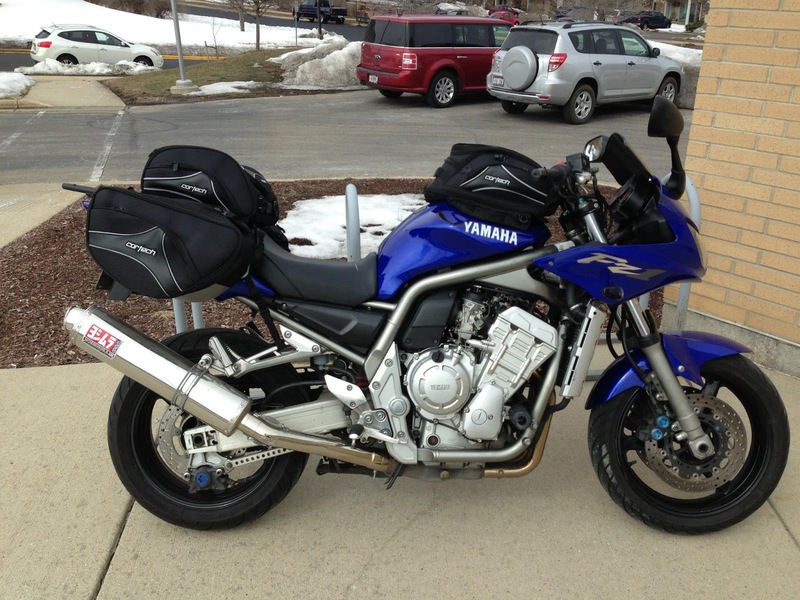 -With a lack of mounting points the near my handy-rack and it’s narrowness I couldn’t mount the tailbag separate from the saddlebags which meant that I would not be able to have the tailbag and a passenger at the same time. All of these issues added up me needing a more acceptable solution for my soft luggage. I decided that the handy-rack would make a good starting point to add on a more substantial luggage rack/bag support system. I detail my plans (somewhat already in process ) in the video below. After I welded up the materials I did a test fit on the handy rack and things were satisfactory. After I test fit the rack I made a change to the original design of the rack and used some ¼” steel dowel I had lying around and I think it worked out a lot better. That night I did some painting on the rack nothing special some Rust-Oleum rattle can gloss black to prep it for final mounting and fine tuning the next day. I think the final results are quite good considering the shade-tree nature of its genesis. I split some vacuum tubing and sip tied it to the edges where the luggage would be coming into contact with the rack for extra protection. Now the luggage is up and out of the way of everything and can stay on the bike with or without a passenger. I do have some concerns about having shifted the weight back past the rear axle so much. I will follow up should that become an issue down the road. The next step for me is going to be a push to go through and inspect the bike to makes sure it is ready to be pressed into full-time use. There are only ten days before the shippers pick it up! Things are happening fast so stay tuned!